(Emcee: There is a lot of research that has been done in the world on the effects of chanting and sound on flora, fauna, animals and even on water. There is one such research that was done by a scientist from Japan that we would like to share with you now. Water is a composed of very tiny crystals. So we will see how different sounds affect the composition of these crystals. As you can see from the video, chanting has a profound effect on the molecular structure of water, and our body is composed of 70% water. Using negative words and unpleasant sounds affects the molecular structure of water adversely. Many Indian traditions such as, wearing a bindi or tilak have a science behind it. Putting tilak on the forehead stimulates the Ajna chakra, which is the chakra for awareness. Such traditions cannot be perceived as mere superstition as they are based on scientific principles from our ancient traditions. 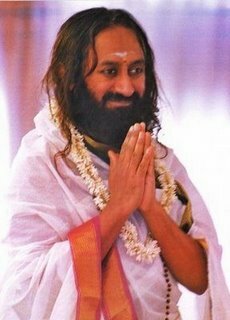 This evening, we have close to 3900 centers from more than 85 countries around the world joining us online for this event of Chanting For Global Peace and Happiness, which we request Sri Sri to lead). 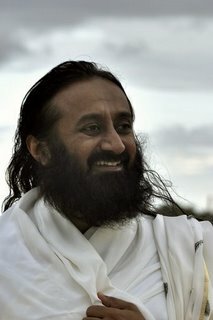 Sri Sri: You know, the scientists have been talking about the Butterfly Effect. When a butterfly flaps its wings in South America, it has an impact on the clouds that are hovering around China. With this being the case, we cannot think that if we sit and do some chanting, it will have no impact on the world consciousness. Every little thing has an impact on the universe because we are an integral part of this universe. As you have seen in the video, chanting impacts water so positively. When we sit and chant these ancient mantras, the crystals of water take a perfect shape (implying harmony and peace). This perfection in the microcosm brings about perfection in the macrocosm, in our society and in the people around us. Today, when the world is caught up in acts of terror, depression, fear, anxiety, tension and mistrust. It is high time that we invoke positive vibrations to help change the situation. The very fact that three million people (including us all) from around the world are coming together to chant, it is definitely going to have an impact on the world consciousness. We cannot think that if we sit and do some chanting, it will have no impact on the world consciousness. When all of us here sit and chant, it will send across positive vibrations into the atmosphere. And these vibrations change the mindsets of people from negative to positive; from darkness to light. Today, one million people in Paris have stood up against violence and terrorism. There are people from all walks of life who have joined this. So it is all the more relevant when we (three million people) also chant together for peace, happiness and for the benefit of the whole planet. Even if one part of the globe is in darkness and caught up in ignorance, the world cannot be a safe and happy place. If a few individuals somewhere in some country or city of the world are stuck in negative thoughts or negative trends, we cannot have peace. This chanting and the prayer that we all will recite today will impact the world in a very subtle way. Everything we do is through our thoughts, isn’t it so? Before any action happens, it first arises as a thought in the mind and then you act on it. What is a thought? How does a thought arise? A thought is nothing but an impulse of energy and intelligence. If this energy that is getting created or generated from you is negative, then it will attract more negativity and negative thoughts. If you are in a positive place, then you will get more positive thoughts. There is a story about King Vikramaditya, after whose name the Shakas or the years of the Indian lunar have been named (referring to years titled as the Vikram Samvatsara). Just like in the Gregorian system we have years titled as B.C. (Before Christ), in the Indian system we have the Vikram Shaka. There is a story, or it is more like an incident. There was a garden which was full of beautiful flowers, fruits and vegetables. The garden was very fertile. People would always want to enter the garden and pluck the flowers and fruits growing there. The gardener of this garden would go stand on top of a small mount and invite the passers-by saying, “Dear one! Come and enjoy the fruits of my garden”. When people would come hearing this, the gardener would come down the mount and then quickly chase them away. He would pick fights with them. People could not understand this behavior of his. They would wonder, 'What is wrong with this gardener? When he goes on top of the mount, he becomes so kind and generous! But when he comes down from the mount, he changes and becomes so rude and stingy'. One of the scholars who heard this asked the people to dig and find out what was really underneath the mount. When the people dug up the mount, they found the throne of King Vikramaditya buried underneath. The moral of the story is that, even places harbor and store vibrations. And these vibrations that are created affect our thinking and behavior. So when all of us here sit and chant, it will send across positive vibrations into the atmosphere. And these vibrations change the mindsets of people from negative to positive; from darkness to light. So do not think that we are going to simply sit here and chant (without it having any effect). By chanting, we will create subtle vibrations which are called as Adrishya (invisible). A thought is nothing but an impulse of energy and intelligence. If this energy that is getting created or generated from you is negative, then it will attract more negativity and negative thoughts. If you are in a positive place, then you will get more positive thoughts. 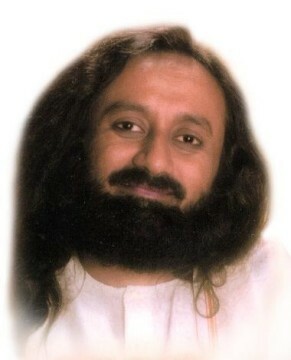 The first mantra that we will chant is 'Satyam Param Dhimahi'. It means, let my mind get soaked in the universal energy and the universal Truth. The second mantra we will chant is 'Om Namo Narayana'. Just look around you and see, electricity is everywhere. Every particle is electricity. But you are able to see the electricity only when it flows through a bulb. Though the electricity is running through the wire, it becomes visible (glows) only through a bulb. That is what the Narayana Tattva really is. It is the Consciousness that exhibits and expresses itself in the (physical) body. When we meet any elderly person or any wise saint, we fold our hands and wish them by saying Om Namo Narayana. It means that there is Narayana (divine) in every Nara (human being). So we shall kindle and awaken the Narayana Tattva within us by chanting Om Namo Narayana. Let us all do these chantings with a sincere intention that the positive effects of these chants reach each and every person in the world. As we chant, let us pray that this world becomes free from violence, depression, diseases and negativity of all kind. We are all here for a really important event today.